Please contact The View from the Shard directly to redeem your ticket using your iVenture Card. Included with your iVenture Card is a multimedia guide in several languages. Please check the website for updates on opening hours and special events. Closed Days Opening and closing times vary throughout the season depending on events taking place, therefore it is recommended to check before you visit. 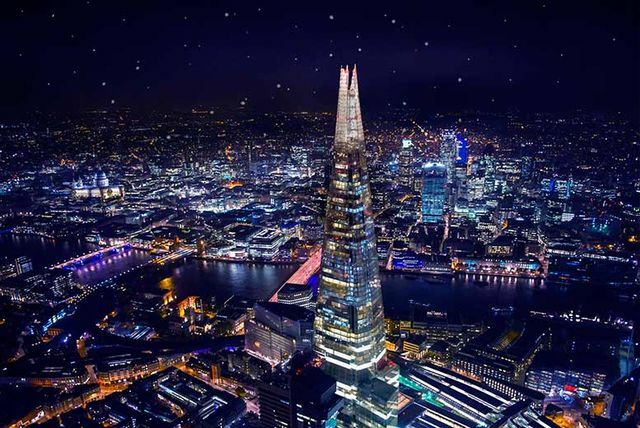 The Shard is one of the world’s most recognisable buildings and home to some of the best restaurants, hotel rooms, apartments and offices in London. But, more importantly, the public viewing galleries on floors 68, 69 and 72 offer the best vantage point in London to capture spectacular views of this great capital city. Standing at almost 310 meters, the Shard is one of the highest buildings in Europe and towers over one of London’s main transport hubs – London Bridge Station, so getting there couldn’t be more convenient. The structure is comprised of eight sloping glass facades – the ‘shards’ - which give the building its shape and visual qualities. As you might expect, from the viewing gallery at the peak of the Shard, the views are simply astounding. The two main viewing galleries are a triple level indoor gallery on Level 69 and a partially outdoor gallery on 72. In addition, the Sky Boutique, a gift shop on Level 68, boasts the enviable accolade of being the highest retail premises in London. The gallery on Level 69 gives 360-degree views of up to 40 miles in any direction. Obviously, from that vantage point, visitors can see all of London’s major landmarks (and beyond) on a good day. Furthermore, there are digitally interactive Tell: scopes that help visitors to identify over 200 landmarks. These are capable of communicating in ten different languages. You’ll be given a time of admission on your ticket and can enter up to 30 minutes before the stated time. A ‘weather guarantee’ means that in the case of poor visibility due to weather conditions, you can come back another day for free. Don’t forget to check out the area around the Shard. The local neighbourhood is a busy cultural hub - arguably one of the most interesting in London and well worth exploring. There are drinks and snacks for sale on the 72nd floor. The nearest tube station is London Bridge accessible via Northern and Jubilee Lines.